The number of animals on the verge of extermination in recent years has increased though it is Kochi Prefecture enclosed by a lot of nature. The seriousness especially has been that the number of livings of birds “Fairy pitta” it decreased every year. Because the fairy pitta is officially admitted as a bird in Kochi Prefecture, and the inhabitants of the prefecture is familiar, too. Fairy pitta’s color is the head has a black line in the center in brown, and the superciliary is a whity-yellow color and has a black eye stripe. Fairy pitta’s rectrix is a black, aist and Ageo cylinder are cobalt color, wing of black and the shoulder is green. Fairy pitta’s egg is the major axis 2.5-2.8 centimeters, and the minor axis 1.9-2.3 centimeters. The egg shell is an iron gray. 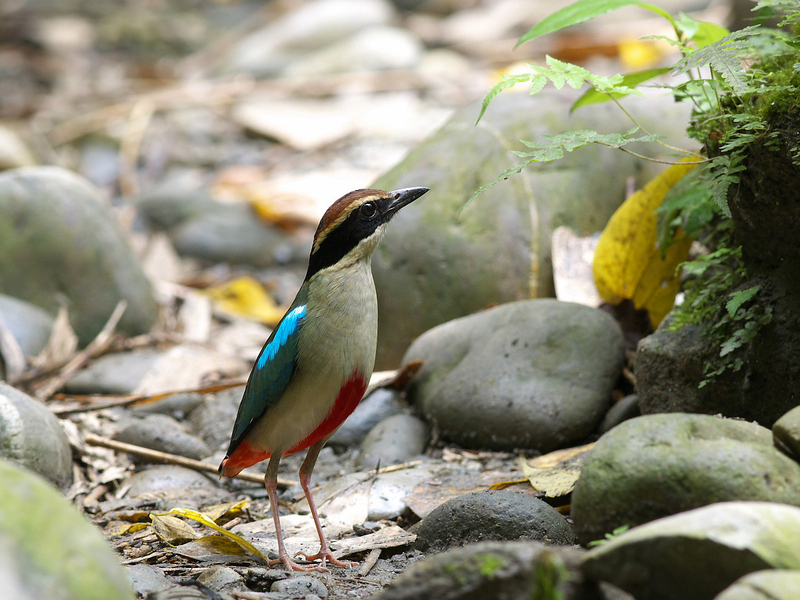 Fairy pitta’s size is 18cm in the total length, wing length 118~127mm nib peak length 22~25mm, length 35~42mm of tail, and sparrow and pigeon’s middle. Fairy pitta’s color so Fairy pitta. Fairy pitta lives in the forest, doesn’t fly so much, hit ground, and walk. Its breeding is domed nest where it reaches 20 centimeters in the diameter with which the forest floor combined the branch, warbles loudly from the tree during breeding time, 4~6 eggs times are laid in Japan in May~July. The breeding form is oviparous, incubated for about two weeks in the ♂♀alternation. Fairy pitta lacks ground with the foot, searches for food, and eats. Earthworm, insect, and crustacean are all kind of Fairy pitta’s food habit eats. Fairy pitta is a kind of endangered species. It’s present situation is number of living decreases by destroying the habitat by development, disturbance by man’s invasion to the breeding area is feared, habitat is deprived by road works and making to the man-made forest, cameraman invades fairy pitta’s nest , and bringing up a child fails. Fairy pitta’s present situation is number of living decreases by destroying the habitat by development so Fairy pitta has been called the bird of the phantom few. Fairy pitta disliked to be extremely cautious, and to approach the nest under bringing up a child so cameraman invades fairy pitta’s honor nest ground and bringing up a child is fails. Fairy pitta was enacted by the prefecture bird on May 10, 1964. Small number of fairy pittas are introduced to the prefecture west in around May. The fairy pitta is continuously confirmed in a part of Kochi Prefecture and Kyushu and Nagano now. Fairy pitta’s habit is that 100~150 has bred in Japan now, tens of are thought for being to exist in Shimant river among these, can be said the density of the fairy pitta is the highest in Japan, the nest was discovered in Kochi Prefecture Sukumo City in 1937. Fairy pitta is a fit name for Yairotyo. I heard that phrase:”the bird of the phantom few” for the first time, but it’s nice.